Miami can be a scary place for pet people like me. Pools, beaches, bays, canals…it’s water, water everywhere. Dr. Khuly’s dogs, Vincent and Slumdog, model life vests and Safety Turtles. Ordinarily, I’d say that’s a good thing. In fact, it’s my favorite thing about my town. Unfortunately, it’s also my most feared, given that I have to live with the memory of a drowned dog. The experience was horrible, and it feels like just yesterday that I lost Marcel so traumatically. Things like that never really fade. Instead, they tend to fester — or get channeled into more productive things, like this post. Each year, I like to write a seasonal article in Marcel’s memory to help remind us all how easily drowning can happen. Whether we’re talking about kids or dogs, it usually occurs in the space of just one cheated breath. Barricades: Ideally, you want a strong barrier between pets and the water. But keep in mind that gates, nets and doors can be notoriously fickle, so be vigilant and make sure that your blockade of choice is always secure. Confinement: Crates are great, especially when you can’t be immediately nearby. There’s no need to take the risk by have your pet loose, right? High-Tech Solutions: Call me neurotic, but I won’t allow my dogs anywhere near a body of water without a Safety Turtle. It’s an alarm system that alerts you when your pet falls into the water. Pets wear the lightweight, turtle-shaped sensor on their collars, which registers a really loud ring at a base station when submerged. If your blind cat or young puppy tumbles into the pool, you’ll know in an instant. 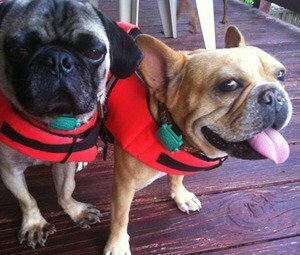 Safety Wear: Life vests for dogs are better than they were even five years ago. They’re lightweight and comfy for the dogs, brightly hued for safety and adorability, and well-equipped with features that make rescue situations less traumatic on everyone, like “pull-me-out” handles and evenly balanced materials for ergonomic buoyancy. Vigilance: I can’t stress the importance of proper supervision enough. Of course, this approach isn’t always so foolproof — my Marcel slipped soundlessly into a pool while I sat a few feet away — which is why the above measures are crucial. All of this water-safety stuff may sound overly alarmist to you. Trust me: You do not want to live with the stress, guilt, and self-recrimination that attends a drowning death you could have prevented. RIP, Marcel. I will always love you. Check out more of Dr. Patty Khuly’s opinion pieces on Vetstreet.